Baby Beetroot, Baby Leaf, Micro Leaf. It is not without reason that Pablo F1 is a winner of the RHS AGM. 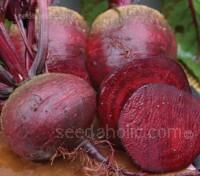 These exceptionally uniform, smooth skinned, perfectly round beets have a wonderfully attractive rich red colouration and excellent skin quality. 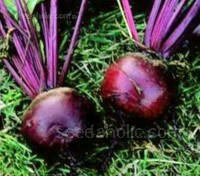 A great choice for baby beetroot or it can be left to mature. Chioggia or Barabietola di Chioggia is a globe-shaped heirloom Italian variety. 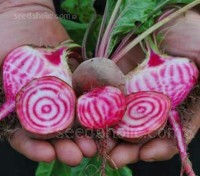 With a rosy orange-pink outer skin and a distinctive dartboard pattern when cut, it is sometimes known as Bull’s Eye Beet or Candy Stripe Beet. Bands of white flesh alternate with bands of pink or rosy red. Barabietola di Chioggia is a globe-shaped heirloom Italian variety, grown today mainly for its unusual colouring, but it has a mild and sweet flavour. It can be sown from very early in the season until late and can be grown in raised beds or containers all year round. “The old Egyptian turnip or flat-rooted beetroot has the best flavour but is scarce.” Bob Flowerdew. Beetroot 'Flat of Egypt’ is a very old heritage variety that produces smooth skinned roots, often heart-shaped, with a deep red, tender and flavoursome flesh. 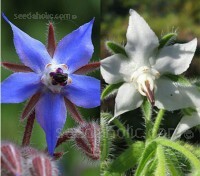 The beautiful blue star-shaped flowers of Borage are edible with a cool cucumber flavour. Use them as garnish in fruit cups, summer drinks, wines and Pimms. Garden visitors can be converted to herbal advocates simply by offering a taste of its flower! Organic Seeds. 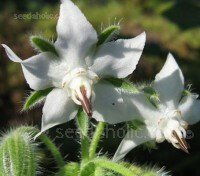 The herb borage is a well known annual. Not so well known is the equally beautiful form 'alba' which boast pure white, perfectly star-shaped flowers. Each flower is centred by five black stamens which heighten the drama. The flowers are edible, garden visitors can be converted to herbal advocates simply by offering a taste of its white flower. 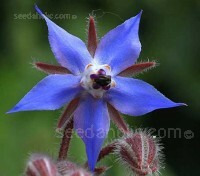 The herb borage is a well known annual with beautiful blue flowers. Not so well known and not often written about is the equally beautiful form 'alba' which boast pure white, perfectly star-shaped flowers. This mixed pack of seeds gives both blue and white forms. 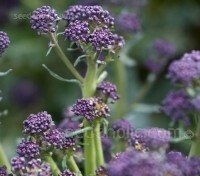 Early Purple Sprouting Broccoli has been selected for its hardiness and flavour. Heavy cropping it has good quality spears that can be harvested over many weeks. 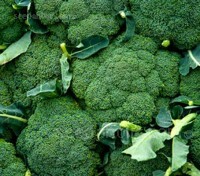 It is one of the most flavoursome of vegetables, standing beside asparagus and globe artichokes. Sweet and delicate, it melts in the mouth. 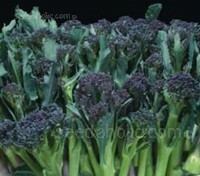 Early Purple Sprouting Broccoli has been selected for its hardiness and flavour, it can be harvested over many weeks. 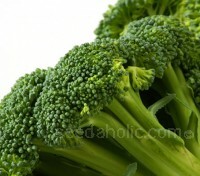 It is one of the most flavoursome of vegetables, standing beside asparagus and globe artichokes. Sweet and delicate, it melts in the mouth. Organic Seeds. Extra-Early Purple Sprouting 'Rudolph' is bred to perform well in the September to February period but is at its best from November to February. With medium to large, deep purple, succulent spears that have outstanding flavour, team with Cardinal for a longer harvest period. 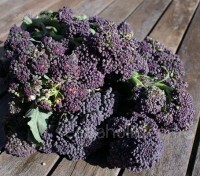 Late Purple Sprouting 'Cardinal' is our latest cropping variety for harvest late March to May. Heavy cropping, it produces medium large deep purple spears with excellent flavour on large framed uniform plants. Team with extra early sprouting varieties for an extended harvesting period. 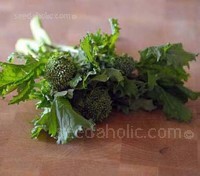 If more people tasted home grown Purple Sprouting Broccoli they would surely cultivate it. You would see it on London balconies, in country herbaceous borders and standing proud in every kitchen garden in the land. 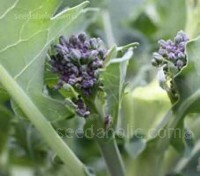 Late Purple Sprouting Broccoli follows on from Early Sprouting. 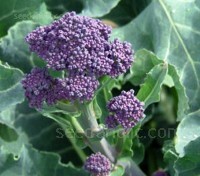 Broccoli 'Summer Purple' is an excellent summer cropping variety that is sown in spring to harvest late June to October. Eaten within an hour of picking, when still bursting with sappy natural sugars, it's exquisite. Flourishing famously in Mediterranean and Chinese cultures, elsewhere Raab is still a bit of a curiosity. 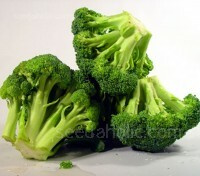 Easy and fast growing, it can be useful as it comes ready when ordinary broccoli isn't available, but this isn't just a replacement for broccoli, it is a great vegetable in its own right. A vast improvement on the older varieties. Calabrese Ironman F1 possesses the usual advantages of a hybrid - vigorous habit with excellent uniformity and high yields of larger than normal heads. Producing excellent quality, uniform dense heads and a very good dome shape. Harvest late June to November. Calabrese 'Marathon F1' has really set the standard for performance, yield and quality. It produces medium size, uniform, dense heads of bluish-green 'beads' on sturdy plants that will grow well in almost any soil and under any conditions. This versatile variety can be used for both summer and autumn crops. 'Miranda' is a very distinctive new Calabrese. 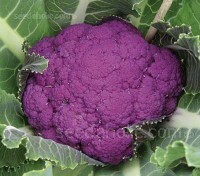 It produces a distinctly beautiful, large violet head on a central stalk. 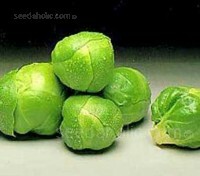 Once the main head is removed, small side shoots form which are tender, delicious and ideal for florets. Hugely fashionable, very pretty to look at and extremely beneficial to health! Developed to withstand the cold of autumn and launched in 1950 ‘Waltham’ has been a favourite ever since. 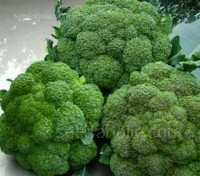 This green Calabrese type produces high yields on compact plants over a long autumn cropping period. Waltham is well known for its fine dark blue-green main head, but also for its exceptional side shoots. Organic Seed. Calabrese ‘F1 Zen’ is a popular variety that produces well structured, high domed, dark green heads which shed rain well. This midseason variety has some downy mildew resistance. 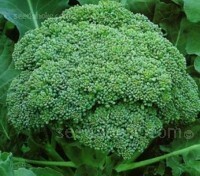 It matures after approximately 90 to 100 days and crops best in autumn after planting out in June. 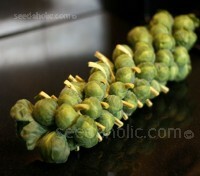 Fresh Brussels sprouts, properly cooked, are deliciously delicate in flavour. Bedford Darkmar 21 is an open pollinated, mid to late season variety, Darkmar gives heavy crops of medium sized, dark green sprouts with a fine flavour. Harvest from December so ideal for Christmas.